• The use of carcass measures to understand lifetime pig welfare status was explored. • Tail and skin lesions acquired in early life remain visible on the carcass. • These lesions were not necessarily visible on the live animal in later life. • Carcass weight was negatively associated with persistent tail injuries. • Therefore carcass lesions and weight provide useful lifetime welfare information. There is increasing interest in developing abattoir-based measures of farm animal welfare. It is important to understand the extent to which these measures reflect lifetime welfare status. The study aim was to determine whether lesions acquired during different production stages remain visible on the carcass, and the degree to which carcass-based measures may reflect broader health and welfare issues. 532 animals were assessed at 7, 9 and 10 weeks of age (early life, EL), and at 15 and 20 weeks of age (later life, LL) for tail lesions (TL), skin lesions (SL) and a number of health issues (HI) including lameness and coughing. Pigs were categorised according to when individual welfare issues occurred in the production process; ‘early life’ [EL], ‘later life’ [LL], ‘whole life’ [WL], or ‘uninjured’ (U) if showing no signs of a specific welfare issue on-farm. Following slaughter, carcasses were scored for tail length, tail lesions, and skin lesions and cold carcass weights (CCW) were obtained. Generalised linear, ordinal logistic and binary logistic fixed model procedures were carried out to examine the ability of TL, SL and HI lifetime categories to predict carcass traits. Pigs with TL in EL, LL and WL had higher carcass tail lesion scores than U pigs (P < 0.001). Pigs with TL in LL (P < 0.05) and WL (P < 0.001), but not in EL (P > 0.05), also had shorter tails at slaughter than U pigs. In relation to TL scores, U pigs also had a higher cold carcass weight compared to LL and WL (P < 0.001), but not EL pigs (P > 0.05). Pigs with SL in EL, LL and WL had higher healed skin lesion scores on the carcass than U pigs (P < 0.001). Health issues recorded during lifetime were not reflected in carcass measures used (P > 0.05). The current study shows that tail lesions and skin lesions, acquired at least 10 weeks before slaughter, remain evident on the carcass and consequently, may be useful as tools to assist in determining the lifetime welfare status of pigs. Low CCW was associated with tail lesions, supporting previous research suggesting that tail lesions have a negative impact on growth performance in pigs. Please have a look at this pig’s tail. You may note that contrary to most EU pigs, this Finnish pig has a curly tail. In addition, please note that this pig does not only has a curly tail. Its tail also has a hairy plume. That is what a pig’s tail should look like: It is the pig’s welfare thermometer. The FareWellDock project has accumulated scientific information directed at reducing the need for tail docking in Europe. In this way it has contributed to ending the progressive melting of the pig-welfare iceberg. But sometimes, a picture says more than a thousand words, for the pig’s tail is an iceberg indicator for pig welfare. Curly pig tail (© Mari Heinonen). By Y. Li, J. Anderson, A. Holten, A.M. Hilbrands, J. Holen and L.J. Johnston, 2016. Jounal of Animal Science 94, suppl 2: 2, p. 8-9. Tail biting is a common problem in growing–finishing pigs, which can compromise health, growth, and welfare of pigs. Because tail biting is an abnormal behavior performed by tail biters toward victimized pigs, understanding these pigs may help us solve the problem. This study was conducted to evaluate immune function of tail biters and victimized pigs. 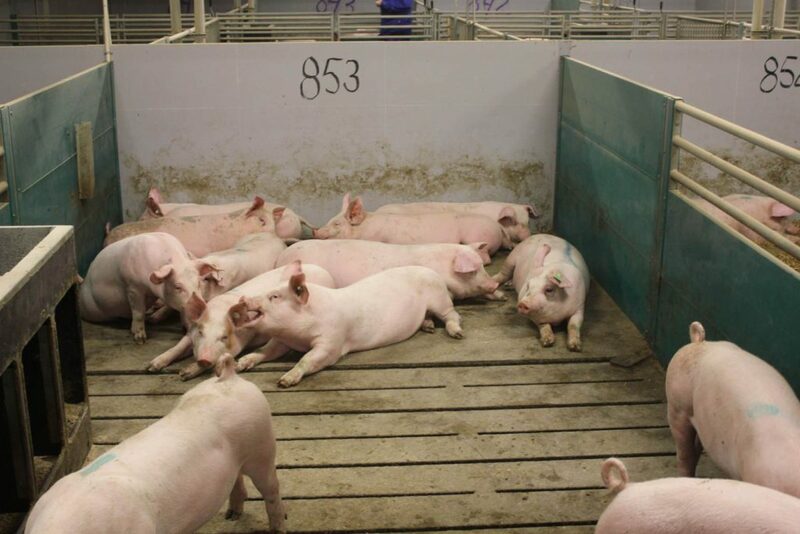 Pigs (n = 240; 25.7 ± 2.9 kg initial weight) were housed in 8 pens of 30 pigs for 16 wk. Once visible blood on a tail appeared, pigs in that pen were assessed daily for tail score (0 = no damage, 1 = healed lesions, 2 = visible blood without swelling, 3 = swelling and signs of infection, and 4 = partial or total loss of the tail). 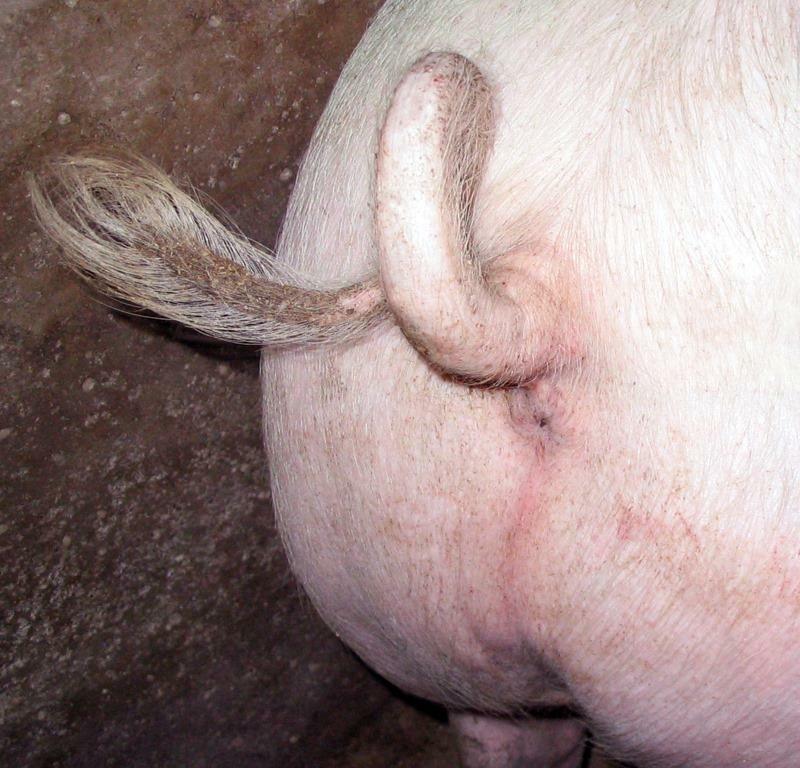 Victimized pigs were defined as pigs with tail scores equal to or greater than 2. Meanwhile, a 2-h observation was conducted for 2 consecutive days to identify tail biters. In each pen in which tail biting occurred, blood samples were collected from victimized pigs on the day that tail biting was first observed as well as from tail biters and 2 control pigs with no sign of tail damage. Fourteen biters (6 barrows and 8 gilts), 30 victimized pigs (21 barrows and 9 gilts), and 28 control pigs (14 barrows and 14 gilts) were identified for blood sampling. Total serum protein and IgG concentrations were analyzed using the spectrophotometric method. Data were analyzed using the Glimmix model of SAS (SAS Inst. Inc., Cary, NC). Compared with control and victimized pigs, tail biters had lower total serum protein (P = 0.01; Table 018) and IgG concentrations (P = 0.01), suggesting poor immunity. There were no differences in total serum protein or IgG concentrations between control and victimized pigs. These preliminary results suggest that tail biters may experience compromised immunity. How much straw is enough? Jensen, M.B., Herskin, M, Forkman, B, Pedersen, L.J., 2015. Effect of increasing amounts of straw on pigs’ explorative behaviour. Applied Animal Behaviour Science 171, 58–63. We investigated the effect of straw amount on pigs’ time spent manipulating straw. We investigated the effect of straw amount on pigs’ simultaneous straw manipulation. Increasing straw from 10 to 430 g/pig/day increased both measures. Increasing straw above approx. 250 g did not significantly increase the behaviour further. According to European legislation, pigs must have permanent access to sufficient quantity of material to enable manipulation activities. However, few studies have quantified how much straw is needed to fulfil the requirements of growing pigs. We investigated the effect of increasing amount of straw on pigs’ manipulation of the straw, and hypothesised that after a certain point increasing straw amount will no longer increase oral manipulation further. From 30 to 80 kg live weight, pigs were housed in 90 groups of 18 pigs in pens (5.48 m × 2.48 m) with partly slatted concrete floor and daily provided with fresh uncut straw onto the solid part of the floor. Experimental treatments were 10, 80, 150, 220, 290, 360, 430 or 500 g straw per pig and day. At 40 and 80 kg live weight, the time spent in oral manipulation of the straw by three focal pigs per pen (large, medium and small sized) were recorded along with the percentage of pigs manipulating straw simultaneously. This was recorded in three 1-h intervals (1 h before and 1 h after straw allocation in the morning, as well as from 17 to 18 h in the afternoon). With increasing quantity of straw provided, we found a curvilinear (P < 0.01) increase in the time spent in oral manipulation of the straw. Smaller pigs spent more time manipulating straw than larger and medium sized pigs (367, 274 and 252 s/h for small, medium and large sized pigs, respectively; P < 0.001), and pigs spent more time manipulating straw at 40 kg than 80 kg live weight (356 vs. 250 s/h; P < 0.001). At both live weights, pigs spent most time manipulating straw during the hour after allocation of straw. 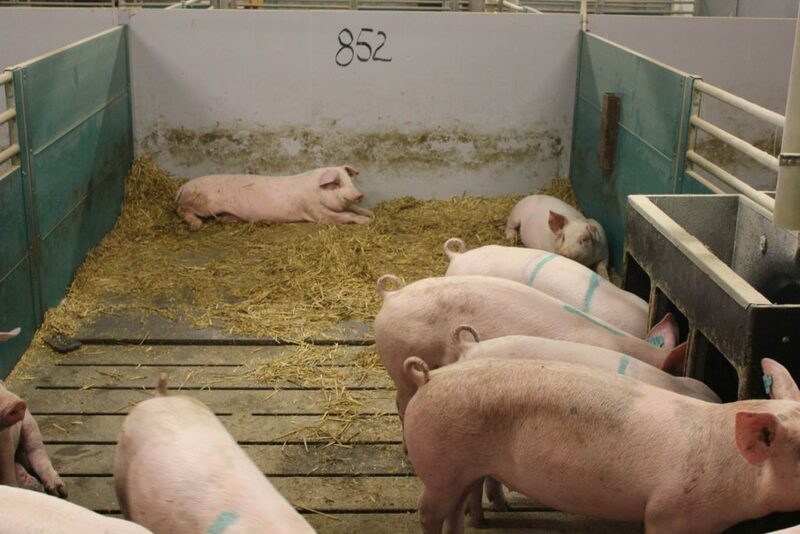 Similar effects of increasing amounts of straw were found for the percentage of pigs engaged in simultaneous manipulation of the straw. Post hoc analyses were applied to estimate the point, after which additional straw did not increase manipulation of straw any further. For the time spent manipulating straw the estimated change point was 253 (approx. 95% confidence limits (CL) 148–358) g straw per pig and day. For the number of pigs simultaneously manipulating straw the change point was 248 (CL 191–304) g straw per pig and day. These results show that increasing the quantity of straw from minimal to approximately 250 g per pig and day increased the time spent in oral manipulation of the straw, as well as the occurrence of simultaneous straw manipulation. Hence, data from the current experiment identified 250 g straw per pig per day as the amount of straw where a further increase in straw provision did not further increase neither time spent on oral manipulation of straw, nor the percentage of pigs simultaneously manipulating straw. This suggests that, within the current housing system and using this criterion, this amount of straw may be the biological turning point for increasing oral manipulation of straw. Telkänranta H, J.N. Marchant-Forde and A. Valros. 2015. 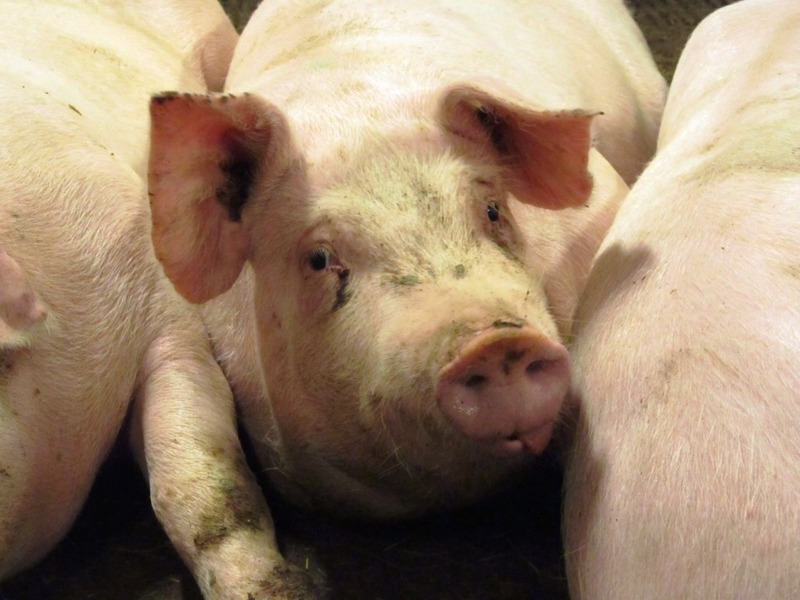 Tear staining in pigs: a potential tool for welfare assessment on commercial farms. Animal, available on CJO2015. doi:10.1017/S175173111500172X. Tear staining or chromodacryorrhea refers to a dark stain below the inner corner of the eye, caused by porphyrin-pigmented secretion from the Harderian gland. It has been shown to be a consistent indicator of stress in rats and to correlate with social stress and a barren environment in pigs. The current study was, to our knowledge, the first to test it on commercial pig farms as a potential welfare indicator. The study was carried out on three commercial farms in Finland, in connection to a larger study on the effects of different types of manipulable objects on tail and ear biting and other behavioural parameters. Farm A was a fattening farm, on which 768 growing-finishing pigs were studied in 73 pens. Farm B had a fattening unit, in which 656 growing-finishing pigs were studied in 44 pens, and a farrowing unit, in which 29 sows and their litters totalling 303 piglets were studied in 29 pens. Farm C was a piglet-producing farm, on which 167 breeder gilts were studied in 24 pens. Data collection included individual-level scoring of tear staining; scoring of tail and ear damage in the growing-finishing pigs and breeder gilts; a novel object test for the piglets; and a novel person test for the growing-finishing pigs on Farm B and the breeder gilts on Farm C. On Farm A, tear staining was found to correlate with tail damage scores (n=768, r s =0.14, P<0.001) and ear damage scores (n=768, r s =0.16, P<0.001). 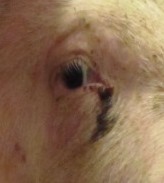 In the growing-finishing pigs on Farm B, tear staining of the left eye correlated with tail damage (n=656, r s =0.12, P<0.01) and that of the right eye correlated with ear damage (n=656, r s =0.10, P<0.01). On Farm A, tear-staining sores were lower in the treatment with three different types of manipulable objects as compared with controls (mean scores 3.3 and 3.9, respectively, n=31, F29=4.2, P<0.05). In the suckling piglets on Farm B, tear staining correlated with the latency to approach a novel object (n=29, r p =0.41, P<0.05). Although correlations with tail and ear damage were low, it was concluded that tear staining has promising potential as a new, additional welfare indicator for commercial pig farming. Further research is needed on the mechanisms of tear staining. Oberst et al. 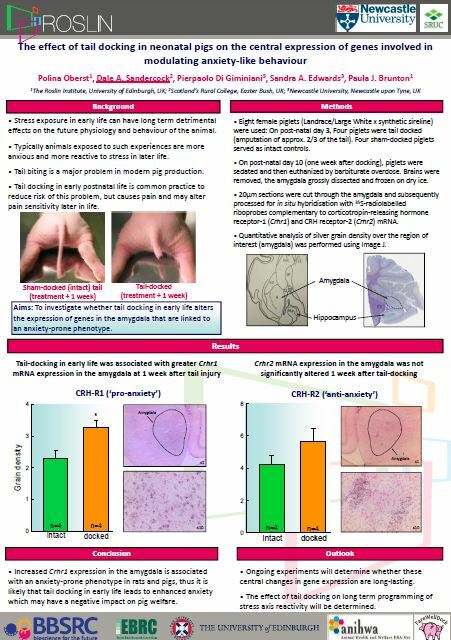 (2015) presented a poster on the effect of tail docking in neonatal pigs on the expression of genes involved in modulating anxiety-like behaviour at the annual meeting of the Scandinavian Association for the Study of Pain (SASP) at the Karolinska Institute, Stockholm, Sweden (13-14th April 2015). Background: Adverse experiences in early life, such as exposure to stress, can have long term detrimental effects on the future physiology and behaviour of the animal. Typically animals exposed to such experiences are more anxious and more reactive to stress in later life. Tail biting is a major problem in modern pig production, both in terms of animal welfare and productivity. Tail docking in early postnatal life is common practice to reduce risk of this problem, but causes pain and may alter pain sensitivity. Aims: To investigate whether a significant painful experience in early life (tail docking) alters the expression of genes in the amygdala that are linked to an anxiety-prone phenotype. Methods: Eight female piglets (Landrace/Large White x synthetic sireline) were used. Four piglets were tail docked (amputation of approx. 2/3 of the tail) on post-natal day 3 using hot-iron cautery and four sham-docked piglets served as intact controls. On post-natal day 10, pigs were sedated and then euthanized by barbiturate overdose. Brains were removed, the amygdala grossly dissected and frozen on dry ice. 20μm sections were cut and subsequently processed using in situ hybridisation with radiolabelled probes complementary to corticotropin-releasing hormone receptor-1 (Crhr1) and CRH receptor-2 (Crhr2) mRNA. Results: Crhr1 mRNA expression was significantly greater (p<0.05) in the amygdala of tail-docked piglets compared with the sham-docked animals. There was no significant difference detected in Crhr2 expression in the amygdala between the groups. Conclusion: Increased expression of Crhr1 in the amygdala is associated with an anxiety-prone phenotype in rats and pigs, thus it is likely that tail docking in early life leads to enhanced anxiety which may have a negative impact on pig welfare. Ongoing experiments will determine whether these central changes in gene expression are long-lasting. [Support: BBSRC, DEFRA-part of ANIWHA ERA-NET initiative]. Oberst, P., D.A Sandercock, P.Di Giminiani, S.A. Edwards, P.J. Brunton, 2015. The effect of tail docking in neonatal pigs on the central expression of genes involved in modulating anxiety-like behaviour. Abstract for the poster presentation at the Scandinavian Association for the Study of Pain (SASP) Annual Meeting, Karolinska Institute, Stockholm, Sweden. 13-14th April 2015. With the increase in attention to animal welfare, researchers have focused their interest on the assessment of pain in farm animals. In humans who cannot self-report, such as infants and unconscious patients, the observation of facial expression is frequently used for pain assessment (Prkachin, 2009). The possibility to assess pain through changes of facial expression has also been studied in animals, and pain scales developed which include the ‘Mouse Grimace Scale’ (Langford et al., 2010), the ‘Rat Grimace Scale’ (Sotocinal et al., 2011) and the ‘Rabbit Grimace Scale’ (Keating et al., 2012). Although with some species differences, the three scales focus on the eyes, nose, cheeks, ears and whiskers of an animal. Although pigs have fewer muscles for facial expression, there are subtle changes in appearance (Flecknell & Watermann-Pearson 2000), but there are currently no published pain scales based on facial expression in pigs. The aim of this research was to investigate if it is possible to observe changes in piglets’ facial expressions immediately after painful procedures. Thirty-one piglets were subjected to tail docking by cautery, while held by the farmer. Images of faces were taken immediately before and after this procedure. These images were sorted and those in which piglets had closed eyes were excluded. Images were evaluated by two treatment-blind observers, scoring from 0 to 2 (0 was no evident tension and 2 very evident tension). Because of the non normal distribution, data were analysed with the non-parametric Wilcoxon Signed Rank Test, which showed that the cheek tension score significantly increased from before to after the procedure (P<0.042). This result shows promise for the adoption facial expression as a tool for acute pain assessment in pigs. Reference: Lonardi, C., Leach, M., Gottardo, F., Edwards, S. 2013. 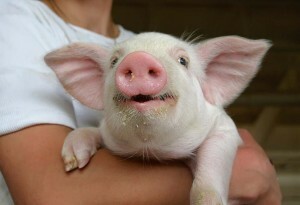 The ‘Grimace Scale’: do piglets in pain change their facial expression? Proceedings of the Joint Meeting of the 5th European Symposium of Porcine Health Management and the 50th Anniversary Meeting of the Pig Veterinary Society of Great Britain, Edinburgh, UK, 22nd – 24th May 2013. 1. Wellbeing is the starting point. Avoid tail biting by prevention. 3. Take care of warm and draught-free resting area. 4. Take care of proper ventilation and air quality. 5. Give stimulation and rooting material preventatively, before problems arise. 6. Take good care of animal health. This article was first published at eläintieto.fi. Dutch Magazin article: Anon. 2015. Varkensstaartje in Finland niet gecoupeerd. [Small pig tail not docked in Finland]. V-focus April 2015, p. 17.